It's that time once again. Time for a full blown Hell Bunny post featuring my current favourites from the latest range. 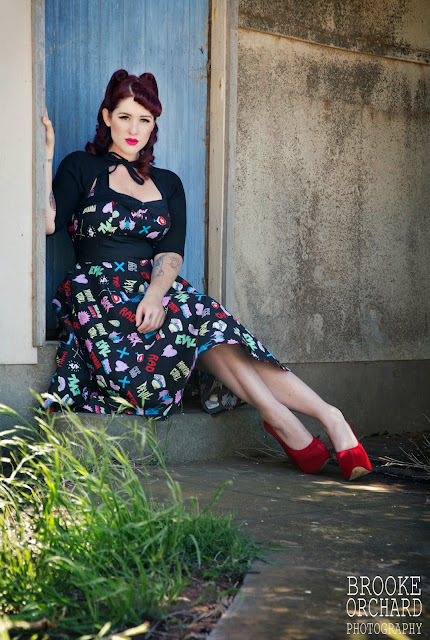 To help me create this post, I teamed up with an amazing local photographer Brooke Orchard who specializes in pinup and retro styles. From the moment I found her folio, I was smitten! Brooke has an eye for that real 'retro' look and creates the most amazing imagery. Our location for the shoot was an very old empty farmhouse located just outside of Melbourne. This location was so fun to work with! Hope you all love the results as much as we do. So enough chatting; let's talk clothing! Now that I've worn this outfit, I think I will have to live in it every day for the rest of my life! The Red Bandana skirt is a cute western print swing style skirt that is brilliant for day or night. The print is very cute and the closer you get the more you see hiding within - skulls, wings and little pistols! I'm wearing this skirt in a size Large. This is now my go-to size in all Hell Bunny garments (on very rouged backs, I can even work a Medium). It fits my waist perfectly and has ample room for the petticoat beneath. I've paired this with my beloved Doris Top from Pinup Girl Clothing and Eye Doll Platforms from Luichiny. 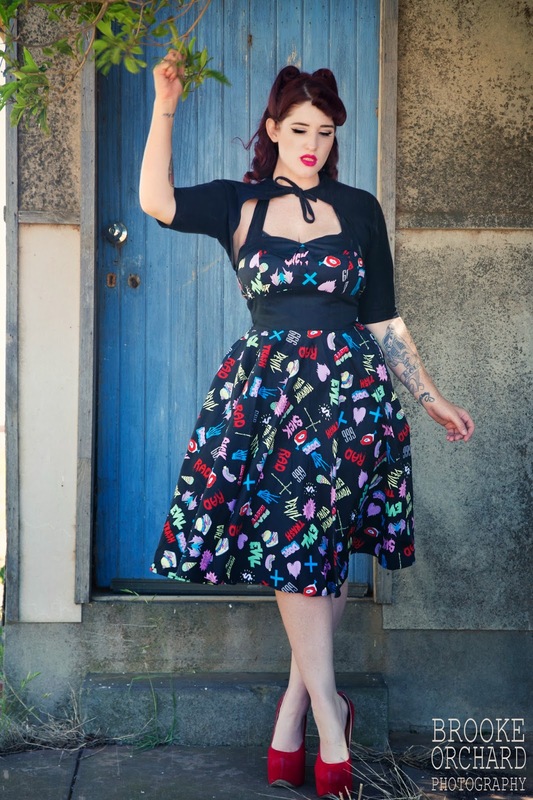 The Doris is a must have for any pinup wardrobe as it matches everything and does wonders for boobies! How stunning is this print? The Catrinas Dress is a new bust style from Hell Bunny. An almost peasant drawstring-like bust that has a pull cord to tighten or loosen the area. I chose this dress in a size Large and while it is fits my waist perfectly the bust is a little small for my GG chest. The floral and skull print is really unique and like many other Hell Bunny frocks they have cleverly disguised skulls as a print which always makes me happy. My favourite feature is the thicker floral border on the bottom of the skirt. Pairing this with any complimenting colour petticoat will give you the extra volume and shape as seen here. 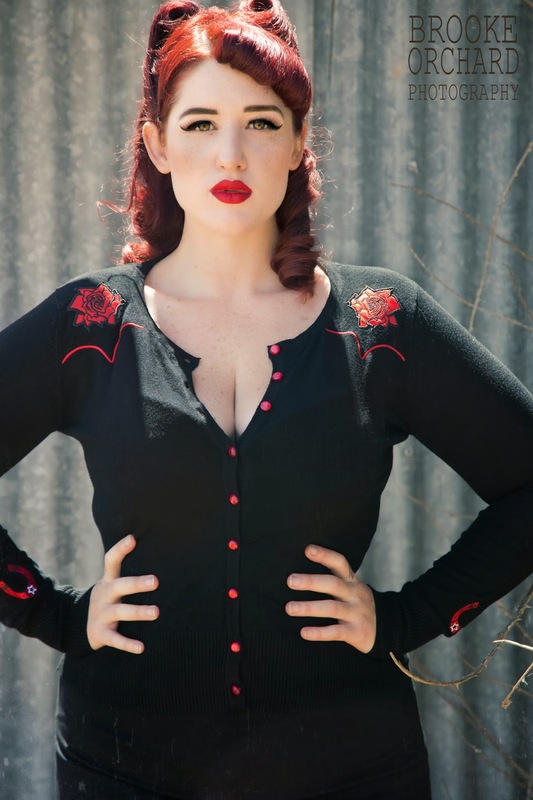 The ultimate cardigan for any western loving pinup! Made from a stretchy rayon, spandex and nylon mix, this cardie is figure hugging and super soft. I'm wearing the large and it fits my waist, bust and high hip perfectly. With the usual western motif's and buttons on both the back and front in a bright and eye catching red this cardigan really pops! Now this style does go up to a size XL but with my measurements I prefer the Large as it's a much more flattering fit. This cardigan also pairs perfectly with the red bandanna skirt at the start of this post as they both feature the same skull/wing design (this is featured on the back of this top). Now that I've tried a Hell Bunny cardigan I'll be collecting the whole range! Such a great style to wear all year round. You can't take the horror loving lass out of me - Never!!!! 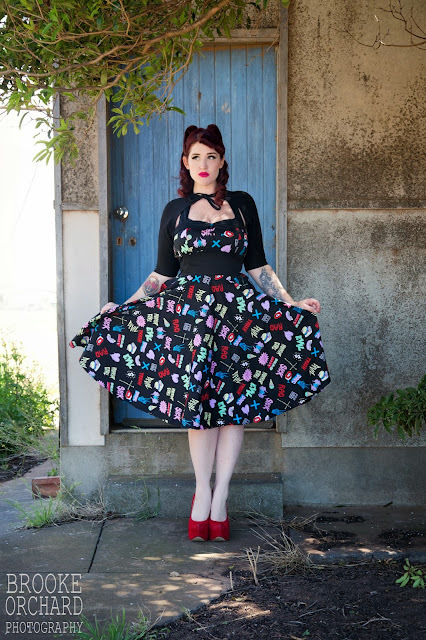 One of HB's most loved dress styles and the go to dress for any rockabilly/retro girl. The 50's style swing dress flatters all shapes and with the thick halter strap covers even the thickest of halter bra straps. I absolutely adore this print!!! This dress is covered in scary words, dripping food bits and all things awesomely gross. The bright print is perfect for anyone that loves having an outfit that attracts attention. I think I'll wear this baby a whole lot this summer. Wearing this style once again has sparked my love for the 50's dress from HB so I have now added this style but in the Catrinas print to my lust list and possibly a gingham style if I can find one! More western goodness! Now when I first saw the new pencil skirts in the catalog I actually wanted the matching red and skull version of this style to pair with the western cardigan. But the moment I laid eyes on this blue and black design I was sold. I love the mixture of traditional western features i.e the arrows and piping mixed in with the heart lockets and deer skull (on the rear). I'm wearing this skirt in an XL as I've not purchased a fitted style like this from HB before. I'm really impressed with the fit as it hugs me in the right places and is fitted firmly all over. Now the Doris top I paired this with is a little larger fitting (many years of wear) so there is a little bit of loose fabric but with this skirt you can tuck in most tops with ease and they barely show through. I'm blown away with every item in this post and can't wait to shoot/try/review more of the Hell Bunny styles next season. Be sure to click all links and if you are looking for a closer retailer you can ask Hell Bunny directly on their facebook or via google search. Be sure to check out Brooke Orchard's website and like her Facebook Page asap. Her work is absolutely amazing and I can't wait till I get to work with her once again. wow oh wow, these clothes are lovely and I really like the farm house too. you rock these frocks!